Whether your child has been playing piano for a while or is interested in taking it up as a new hobby, playing the piano is one of the most amazing instruments you can encourage your child to learn. Not only can it give them a chance to experience a different skill, learning an instrument, such as piano, comes with a huge number of physical and mental benefits. Getting your child to learn the piano may not always be the easiest thing to do. However, with the right type of encouragement and the proper piano to play, your child will be well on their way to becoming a professional. But, with so many pianos to choose from, how can you be sure which one is perfect for your child? The following are my top pianos that are specially designed for children to give them the best playing experience. 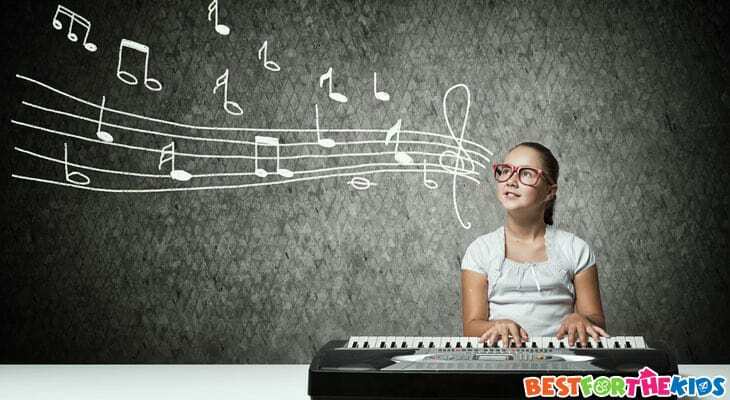 If you're not sure what you’re looking for, my definitive buying guide to children’s pianos will give you all the information you need to make the perfect purchasing decision. To begin my list, I’ve chosen one of the best pianos on the market, which has been designed for younger children to give them the best possible start. 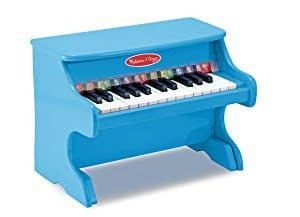 This small piano sports 25 playing keys and two full octaves, enabling your younger children to easily and effectively learn the basic chords, techniques, and songs, which is the best way to introduce your child to the skill. The piano itself is made from the highest-quality wooden materials, making sure that it has the most durable design possible, and it is easy to position in any room in the house, giving you a truly personalized experience. This piano comes with everything you need straight out of the box and includes an illustrated songbook, perfect for teaching your child the fundamental skills required to play the piano in a fun and engaging way. What's Great About It: The engagement levels your children will get from this piano are outstanding. From the simple 25 key setup to the inviting and attractive color scheme, you can be sure that this is one piano that your child is going to fall in love with. If you’re looking for something a bit more traditional with a touch of class and style, the Schoenhut 25 key Piano makes the perfect addition to any home or music room. Suitable for children over the age of 3, this traditionally styled piano boasts a classic white paint job that gives this creation an incredibly professional feel. The piano prides itself on its 25 key setup, which are also slightly wider than normal piano keys, which is ideal for beginners. This will allow your child to learn different techniques a lot faster and with more ease. Made from the highest-quality wooden materials, this mid-weight piano is made to the highest quality and durability standards, meaning you can enjoy the knowledge that you have purchased a piano that will last. Available in three striking and engaging colors, the Schoenhut gives you a quality piano, backed up with over 140 years in the piano industry. What's Great About It: One of the greatest features of this piano is how much effort has gone into making it completely suitable for children. 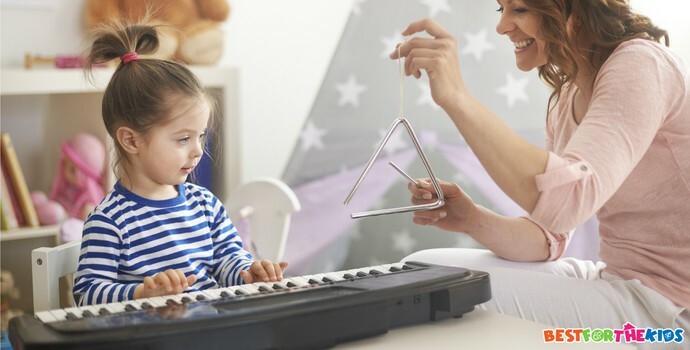 With the piano, you’ll find an included Tri-Play learning system which has been specially designed and patented by Schoenhut, making it even easier to teach your child chords and finger techniques. If you're looking for a piano setup that’s specially designed for your younger children to introduce them to this amazing hobby at a young age, this piano may be for you. The Fisher Price Kid Piano is ideal for babies and children under the age of 3, and creates a fun, colorful and exciting piano experience that they will love. 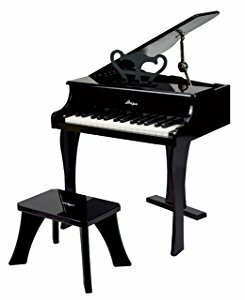 This piano boasts multiple controls, from a small 7 key bench with buttons for various sounds, effects, and notes to the 6 key floor mat, allowing your child to play when standing on the mat. In the included sound effects database, your child can enjoy authentic piano and drum sounds, played with their hands or feet, encouraging healthy coordination development. The light up buttons and drums keep your child engaged while maximizing the enjoyment of playing. There are also rattles, toys and little play pieces securely connected to the piano to engage your child. 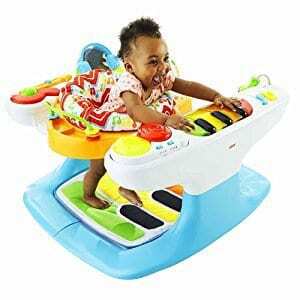 What's Great About It: Designed especially for younger children, this multi-purpose piano setup can double up as a play set, giving your child access to all the connected toys while making sure they are safe and comfortable. If you’re interested in a more traditional style piano which is suitable for younger and older children alike, look no further than the Hape Grand Piano. Suitable for children aged 3 and older, this classic piano prides itself on its outstanding sound and appearance, the perfect addition to any family home. Just like classic grand pianos, you can even lift the lid, safely allowing your child to see the ins and outs of how a piano works, ideal for developing their knowledge and confidence when it comes to musical instruments. 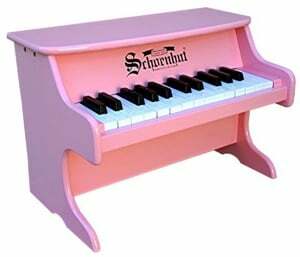 Available in two outstanding and vibrant colors, this high-quality piano is made using non-toxic paints and materials, so your child is safe at all times. The piano boasts 30 keys, perfect for children who are beginners and parents who are looking for a way to teach their kids piano without having to struggle with a full-sized keyboard. What's Great About It: One of my favorite points on this piano is how it is built. Produced by one of the leading children’s piano company’s, this hardwood piano is purpose-built to last, allowing your children to play the piano in whatever way suits them best. Sometimes, it’s easier to introduce your children to the piano using a full-sized keyboard. Fortunately, you can still enjoy the rich sound while gaining the many benefits of a customizable experience. The RockJam SuperKit is an electronic keyboard, designed to mimic a traditional wooden piano, but still comes packed with features that your children are going to love. 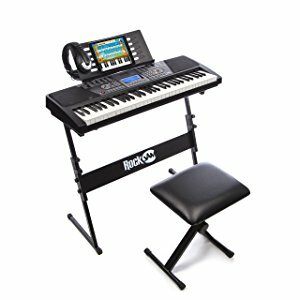 This full-sized, 61 key piano comes with an LCD screen, over 100 keyboard sounds, 100 drum rhythms, and 50 built-in demo songs, giving your child endless possibilities of songs and techniques to learn. This sturdy keyboard is made using the highest-quality plastics, and is lightweight enough to be easily moved to any room in your home. What's Great About It: As the name suggests, this keyboard is part of a SuperKit. This means your set includes a stand, a comfortable stool and a set of headphones, giving your child the ability to play without disturbing other people in the house. There are so many options to choose from when it comes to pianos for your child. To give you a helping hand, follow my buying guide below for all the information you need to make the perfect choice for your children. When shopping for a piano for your children, the number of keys that your chosen piano has is one of the most important aspects to consider. If your child is relatively young, they may not be able to reach all the keys yet. Getting a piano that is too big for your child may discourage them from wanting to learn. Especially for beginners, it’s recommended that you choose a piano with half the number of keys as a normal piano. This is usually around the 30 to 40 keys. This will give your child a broad spectrum to play on, but not so much that it becomes overwhelming and frustrating for your child. There are two types of piano to choose from. Firstly, the most traditional type of piano is an acoustic. These are typically made from wood and are what most people would call a normal piano. These pianos are durable and produce a very rich sound that’s unparalleled. However, this type of piano takes a lot of care and attention and will need regular tuning to maintain its incredible sound. In order to get your piano tuned, you will need to call a piano tuner, which can be costly. On the other hand, you have electronic pianos, commonly known as keyboards. These usually only come in full-size options and are usually more affordable because they are produced from plastic and contain no acoustic sound wires. These keyboards are ideal for children, and can give them access to a whole variety of customization options so they can create their own style of play. However, the sound quality of these keyboards is usually through a lower-end speaker and doesn’t come close to an acoustic. When shopping for the ideal piano, always consider how experienced your child is. Most pianos suited for children will state their recommended age and the skill level that the piano is suited for. If your child has never touched a piano before, always choose the beginner’s option. It may be tempting to choose a full-size professional adult piano with the hopes that your child will grow into it; however, these large pianos can be overwhelming to your child and can easily put them off the hobby altogether. If your child is a beginner, the simpler the piano should be. Hand-in-hand with the consideration above, many pianos may come with small parts, or be large in size. Imagine the pianos you would see at a concert hall. These are huge pianos and not only would they disrupt the space in your home, they are simply too large for your child to learn on. Starting with a smaller piano until they have gained confidence is essential. Encouraging your child to learn how to play the piano can be a rewarding task for both you and your child. It’s a fantastic skill in itself, but will also help to teach your children about perseverance, hard work, and patience. These are all lifelong skills and only have positive properties. Include your child in the buying process and give them a selection to choose from to see which they like best. This way they will feel like they’re in control from the very first stages, giving them the ability to believe that this is their responsibility, which makes for a very enjoyable for them.